Walter DOXEY was the webmaster's great-Uncle, and a mysterious figure until David Bradley emailed out of the blue with this info. Thanks David. 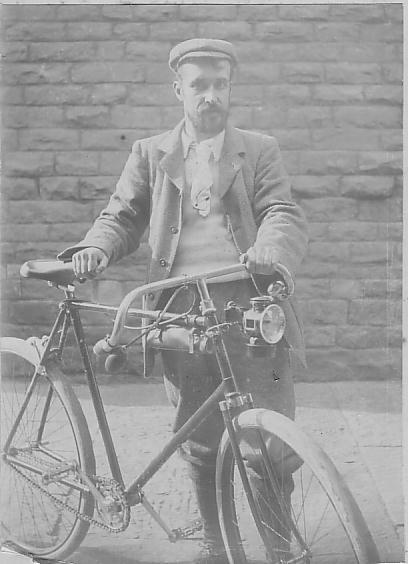 Walter and his bicycle (see photo 110). 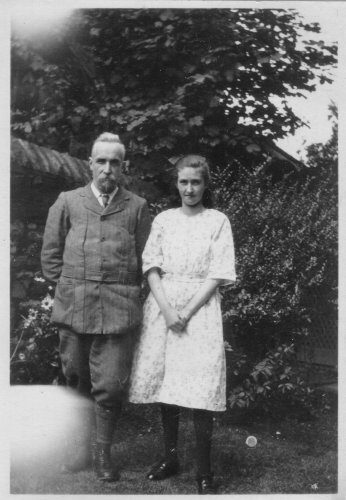 Walter and his daughter Marjorie (see photo 227). I promised ages ago to try and put together the family tree for Walter Howe Doxey and where I fit into the tree. Please find the tree below with bits of information relating to it. I've also included a couple of photos that have been handed down. I have a some more and a collection of postcards of Matlock about 1000 which I must scan and send to you. [See David Bradley's info below, and a tree drawn from them. Marjorie. Married a naval officer in Hull, had no children, husband died. Doris. Became a teacher and lived in Hull, Goddard Avenue. Died at 1 St Cuthberts Rd Churchtown, Southport. Lucy. When Walter died went to live with Doris who had moved to Fairfax Av. when Lucy died. John married Mary Berry, Born 1898 The Beeches, Matlock. Died 1992 in Matlock. Married Edward Geofrey Bradley of Tibshelf. Born 1928. Died 2002. George Berry of Monks Cheshire Brn Abt 1835.
in John street Monks Coppenhall Cheshire. was a coppersmith moved via Crewe to Matlock. Married Bertha Bettina Web Married in St Pauls Crewe. Domestic Servant then a Fish Fryer.